Sally built herself a website when she first started out in business! Funds were tight and it seemed like a great idea to ‘get her started’! It was ok at first she had her logo and services on there and a contact form too and it ‘did the job’ But 2 years on… her business had grown and evolved and her website was outdated! She began to realise that her cheap option no longer gave her what she needed! There were hidden costs creeping in and only certain things she could now update. She wanted to add a blog to her site and to start building her email list through offering free guides and downloads and it was just not possible. In fact her website had started to look like an out of date templated design that really wasn’t working for her! She felt totally frustrated! It was time for change! Sally knew it was time for change, time to ‘get with it’ and up level her website… She needed a new professional website that totally reflected her business, one that she could update for herself so it could grow with her business and one that she could have total control of! She didn’t know where to start, she had been told a WordPress website would be the best option for her but it all seemed totally overwhelming and although she had more money than when she first started out she didn’t have thousands to recruit a web designer to build a site for her. She rang her friend Caroline. Caroline had just launched an amazing new website and she wanted advice on where to start!… Caroline told her about a fabulous online programme she had joined. She had built her own website that she loved and not only did it look beautiful… it was working for her! Her new website looked amazing, super professional and really reflected her personality and business!! It was really visually beautiful but also engaging!… It had loads of cool stuff like links to her social accounts, a blog, sign ups to her ebook – it even had video and best of all she had done it ALL herself! Sally needed this programme!!! she realised that not only would she have access to all the training modules from home so it would fit it in with running her business, she could get life time access to all the resources! So what if she got stuck? Caroline explained she would get one to one support in a Facebook group with live sessions and not only that be connected to a community of like minded business owners who would also help and support her as she built her new site! So Sally signed up! and four weeks later she has her own shiny new website. She is now using her website confidently and is so proud of it she is shouting it from the rooftops which is also helping her social media content too! She has already had her first enquiry and a tonne of fabulous feedback from her existing and new clients! Every day I work with lovely business owners like Sally to create websites that they are super proud of! 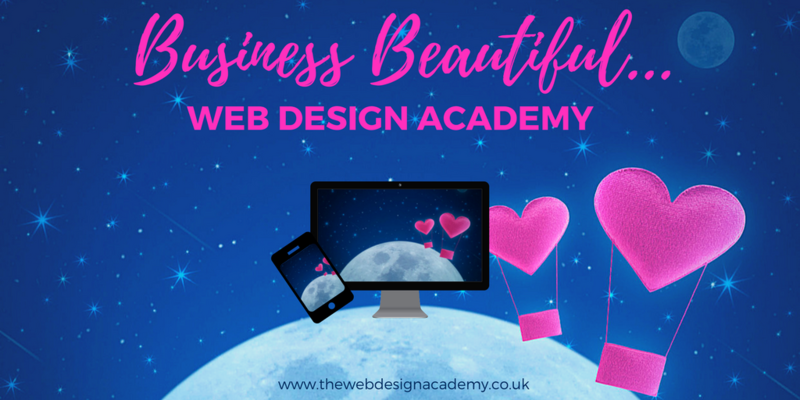 If Sally’s story resonated with you and you are suffering from website shame, come and join my Business Beautiful Web Design Academy! JOIN NOW and get a FREE one to one call with me, website set up and 3 months FREE hosting worth £197!!! You will be able to as shop (if you need to) or even a membership site. You will be able to create branded emails to your customers and learn how to make your online presence more successful, drive more traffic and make more money! Easy to follow modules that take you through everything from choosing your domain name, setting up WordPress, Designing Your Website right through to picking gadgets and gizmos to help you promote your shiny new site. Bonus modules on branding, social media and email marketing! There’s also an exclusive Facebook group for programme members to share, air and support. And you’ll also get plenty of support from me throughout the programme too.